My next door neighbor asked me to help her with invitations and the dessert table for her daughter's baptism & 1st birthday. A doily I found laying around in my home office, left over from another party I had planned (a rustic bridal shower). Thinking outside of the box to acheive the look/style I want, while staying on a budget. Invitations: We had been going back and forth between what we should do in a short amount of time. Some of the styles she showed me were beautiful but expensive and time consuming so luckily we came up with the doily alternative. Affordable but beautiful. 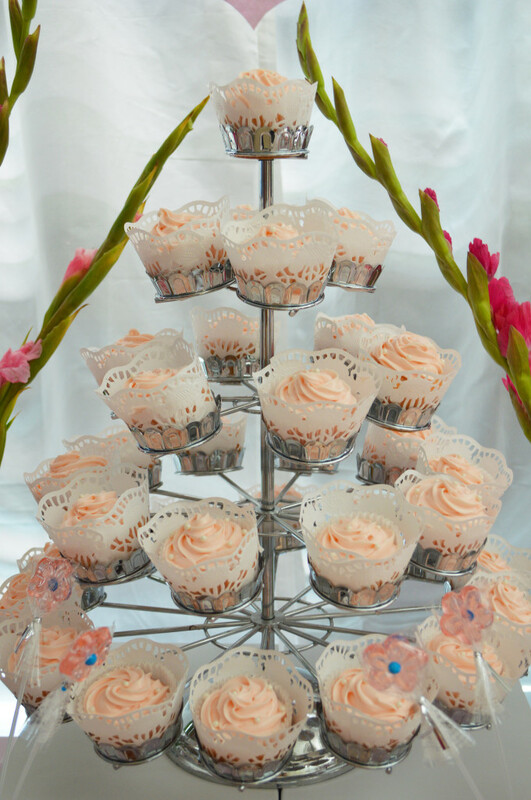 Decor: 2 plastic table covers covered the dessert tables (one plain pink & one white lace). We used a sheer Ikea curtain to cover a window that had Espresso colored blinds. I went to Office Depot to print "Alessandra" big enough to hang above the dessert table. I reused a set of tissue pom pom garland from a baby shower to sway along the window. My neighbor ordered extra flowers for the dessert table to tie it into the centerpieces she had on the guests' tables outside. Doilies can be found at all the craft & party stores. If this is a theme you'd like to try for a party..don't be shy to pick up a small pack & play around with it. You might be surprised at how much of an impact it will make on your party styling.